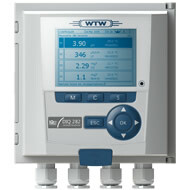 The IQ Sensor Net is a continuous on-line water quality measurement system which uses digital communications to interface between all connected components. The controller may communicate with one or more sensors, over significant distances allowing for local and remote sensor communication. Two types of digital controller provide unrivalled choice and flexibility whilst maintaining commonality of component and user familiarity. Provision of automatic air cleaning combined with robust build quality ensures the optimum of performance and protection against damage, even the harshest of environments. The submersible sensors are of robust stainless steel construction providing the optimum of protection even in the harshest of environments. The sensors may also be mounted into a small tank, pipes and flow cells, providing complete installation flexibility. The water testing technology is therefore very versatile and is suitable for water and waste-water quality measurement. The 50 Series controller is a very cost effective digital communication interface to an extensive range of sensors cover all key parameters. The controller may communicate with multiple sensors, over significant distances allowing for local and remote sensor communication. Provision of automatic air cleaning combined with robust build quality meets the demands of water and waste-water applications. The sensors may also be mounted into a small tank, pipes and flow cells, providing complete installation flexibility. The water testing technology is therefore very versatile and is suitable for water and waste-water quality measurement. 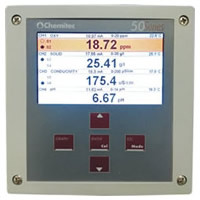 Modular digital interface accepting multiple sensors including pH, DO, turbidity, ammonium and nitrate suitable for water & waste-water quality monitoring. In-line Conductivity measurement for water and waste-water applications [multiple parameter and multiple sensor connection]. In-line Turbidity and Suspended Solids measurement for water, waste-water and sludge applications [single and multiple sensor and parameter connection]. The pH electrode S401 DIG and the ORP electrode S406 DIG are suitable for the measurement of pH and ORP in various appications. 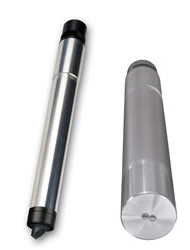 The S411 DIG probe is used for measuring conductivity in pure and process waters. The S423/C/OPT Optical Oxygen Probe is used for the optical measure of dissolved oxygen. The S461LT probe is used for the optical measure of turbidity in pure and process waters up to 100 NTU. The probe uses the 90° scattered light method. 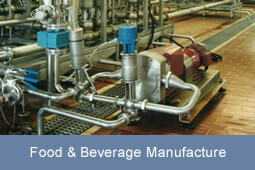 The S461S probe is used for measuring suspended solids (MLSS) in Liquor and process waters. The S461/TN probe is used for the optical measure of turbidity in pure and process waters up to 4000 NTU. The probe uses the 90° scattered light method. In-line continual measurement of SAC (UV 254nm) & Nitrate, for municipal waste-water applications [single and multiple sensor and parameter connection].